There is no record of the origin of the Egyptian Mau cats and it is fraught with uncertainty. It is, however, considered to have descended from wild African cats. If one sees walls paintings of Ancient Egypt, one will easily be able to identify the ancestors of the modern day Mau. The word mau literally translates to ‘cats’ in the Middle Egyptian language. There are no specific types of Egyptian Maus. 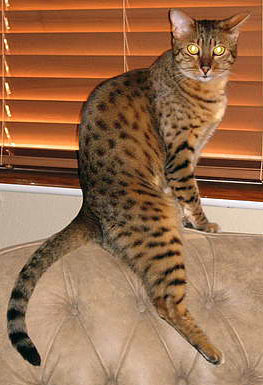 The Egyptian Mau is a small to medium sized cat and has slender, muscular bodies. It’s body is randomly spotted and it has banded legs and tails. It has gooseberry green eyes, distinctive mascara lines and a worried expression on the face. It has a graceful cheetah-like stride. Its coat is typically in one of these five colors- silver, bronze, pewter, smoke and blue/pewter. It is the fastest of all domestic cats, thanks to a unique skin flap extending from the flank to the back knees. Egyptian Mau cats are known to posses musical voices and can chirp and chortle amongst other sounds. They also do a happy dance when extremely joyous. They are extremely intelligent and loyal. They are considered to have a slightly dog like personality. 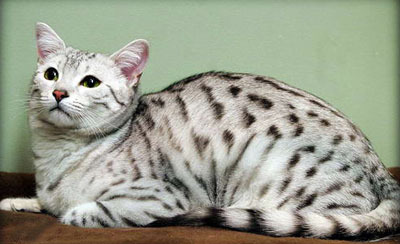 Egyptian Mau cats are far more sensitive than other breeds. They need very warm temperatures. They are also likely to be more sensitive to medicine and anesthesia. They have the longest gestation period of 73 days. Does the Egyptian Mau make a good house pet where small children live? Also, how much do they cost? They make great pets. Egyptian Mau Cats live up to 15 years, grow up to 2.5 to 5 kgs and cost $600 to$800. I had a cat I swear was related to the Mau. He looked like a mini panther and had phenominal hunting skills. He was very sensitive to medicine; I could barely put flea juice on the poor guy. I would say that this type really is like a mini jungle cat and therefore not the best type for small children. I would get an American Shorthair, they are wonderful family cats. I live for this cat. This is the only cat I choose to own. I’ve had two now even watched my first give birth to 8 beautiful kittens. I have a four year old, and my cat does great with her. Whenever my daughter is on my mau’s nerves she just walks away.. very loyal very lovey..
Yes…. They can control time itself…. My Egyptian Mau was 2 years old when I got her. She was a breeding cat which hadn’t bred and the breeder wanted to find a home for her. She would hiss and spit everytime that anyone (including the breeder) got near her. It was quite scary, but it was all front, she didn’t scratch or bite. Once she had had her shots I spent a week in a room with her and my other cat and by the end of the week she was sleeping with (on) me. She is still very nervous when I am standing and won’t let me pick her up despite being with me nearly 3 years now, but when I am sitting or lying down she will let me hold her, will lie on me and cuddle and is the sweetest cat that you could imagine. Given how she was when I got her and how sweet she is now I would imagine that had she been with me from a kitten that she would be much more relaxed around people and would love having kids around as they would have more energy and time to play with her than I do. I sleep on my back and often wake with her either lying on my chest or between my legs. I have found that she doesn’t like the cold and she will come and tell me so and I’m so daft that I will fill a hot water bottle for her to curl up with. My Egyptian Mau will come and sit on the chair arm and talk to me. Mostly it’s to tell me something – She wants to go out, She’s cold and wants a hot water bottle, She wants a cuddle, She’s hungry or She wants to go to bed. I couldn’t imagine life without her now. I would recommend them to anyone. CUTE!!!!!!!!!! omg they are the wildest and cutest thing ever! love em soo much! I have a pair of twin brother Mau’s. Thor and Loki are 7 mounths old now. I can say that they are a most wonderful edtion to my household. They have formed a extreamly strong bond with my dog, as well as my daughter, and myself. . The Mau boys as I call them, are just beside themselves whenever their dog goes outside, or one of us is in the shower, or even just leaving for a min to check the mail. The Mau boys are very much little imps. They have learned to open doors, and turn on the kitchen sink. They love water and I have to keep the water dripping, since they love to drink from the tap. One of the funniest things they do is use one paw to scoop up water, when they do drink from a water dish. I can say that they have brought much joy to my family.